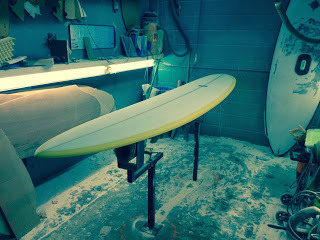 This is my next Nova Speedster winter demo board. At this stage it has been hot-coated and sanded, and is waiting for red pinline and gloss coat. The Nova Speedster model is designed to be surfed off the tail, in larger, more powerful surf. Overall rocker is flatter than the standard Nova for speed and faster paddling. I borrowed the rockers from the old Clark Foam 9-8S blank, and had them applied to a US Blanks 9-9B. I also used a double 1/8″ basswood T-Band stringer for added strength. I’ve chosen a 7″ Parrish center fin from True Ames, with the new 4″ TA Side-bites, all in red (of course!). The 4″ SB will provide plenty of drive and hold. Dimensions are 17″ x 23″ x 14″ 3-1/4″ thick with medium, tucked rails. I kept the bottom very straightforward, with slight convex in nose, flat middle and V through the tail. No concaves to slow water flow. A slightly more narrow version, which is headed for the wintertime waves at San Francisico’s Ocean Beach, is being picked up tomorrow. I’ll post some photos in a couple of days. Its December 5th, is your winter longboard ready?